The below artworks are the most important by James Abbott McNeill Whistler - that both overview the major creative periods, and highlight the greatest achievements by the artist. Artwork description & Analysis: Originally titled The White Girl, this painting depicts a young woman, Whistler's mistress and model Joanna Hiffernan, with long, flowing red hair and wearing a simple white cambric dress. She stands on a similarly colored bearskin rug as she grasps a white flower at her side, her distant gaze lending her a doll-like quality. Indeed, Whistler treats her as a toy or pawn of sorts in that that artist is here less concerned with the accuracy of portraiture as he is with using the canvas as a means of exploring tonal variations. That Whistler later re-titled the painting Symphony in White, No.1: The White Girl to draw attention to the varying white tones of the work and suggest a comparison between them and music notes, clarifies this objective. The painting bears the distinction of being the first work to truly achieve fame for the artist. Rejected by London's Royal Academy and the French Academy's Salon for its inappropriate subject matter that seemed to suggest the loss of innocence, the painting appeared in the Salon des Refuses in 1863, where it was greatly admired by Édouard Manet, Gustave Courbet, and Charles Baudelaire, among others. Symphony in White denotes Whistler's shift from mimicking Courbet's realism to developing his own signature abstract style in which he focused on using subtle color variations, texture, and the careful balancing of forms or shapes to convey a mood that would appeal to the senses. Oil on canvas - National Gallery of Art, Washington, D.C. Artwork description & Analysis: In this work, one of at least five paintings created by Whistler in Trouville, a solitary figure stands on a beach, looking out across the wide expanse of water before him. The figure's gaze directs us toward two sailboats that appear right of center along the high horizon line. The bearded man depicted on shore is the artist's friend and Realist painter Gustave Courbet, who accompanied Whistler to Trouville in 1865 when this painting was created. Originally titled Courbet - on Sea Shore, Whistler later changed the title to reflect his growing interest in associating his painted canvases with musical compositions. The figure and the landscape in which he resides almost disappear into the washes of color Whistler delicately applied through sweeping brushstrokes of thinned paint. The painting pays tribute to Courbet, who deeply influenced Whistler's early artistic development, and yet it also signals Whistler's movement away from Courbet's realism toward Aestheticism. Trouville has no clear meaning or moral message. Instead, it exemplifies Whistler's experimentation with color tones and methods of applying paint to the canvas surface so as to promote visual or sensual stimulation. This notion that color harmonies, mood, and beauty of form are more important than the subject matter itself was at the heart of "art for art's sake," the proud motto of the Aesthetic movement, for which Whistler became a leading proponent. The soft colors and dreamy, atmospheric quality created through Whistler's use of broad, sweeping brushstrokes also marks this painting as an important precursor to the American Tonalist movement of the 1880s. Artwork description & Analysis: Otherwise known as Portrait of the Artist's Mother, Anna McNeill Whistler is clothed in a long black dress with a simple white lace cap, seated in profile, steadily gazing ahead, and holding a white handkerchief in her lap. On the wall behind her appears a reproduction of Whistler's View of the Thames. The Japanese-inspired floral patterning on the curtain hanging at left denotes the artist's well known interest in the Japanese aesthetic. Whistler's stylized butterfly signature is just visible at the top right corner of this curtain. The arrangement of forms appears simple when in fact there is a careful balancing of shapes at play. For example, the rectangular shapes of the picture on the wall, curtain at left, and the floor help stabilize the sitter's form. A religiously devout woman, Anna McNeill Whistler had been living with her son in his London home for seven years when he asked her to pose for him after a model canceled a scheduled session. At 67 old, Whistler's mother found it difficult to stand for extended periods of time and so the artist changed the pose to a seated position for her comfort. In 1891 the painting became the first American work to be purchased by the French government. This elevated Whistler's reputation and aided him in securing wealthy American patrons. Considered an iconic painting, Portrait of the Artist's Mother is one of a very few, including Edvard Munch's The Scream and Grant Wood's American Gothic, that can be appreciated by the art-viewing elite while also resonating with the masses with minimal explanation required. It is overwhelmingly interpreted as symbolic of motherhood, mourning (due to the colors used), or American Puritan Stoicism (because of the sitter's clothes). This particular image has been the source inspiration for many other paintings, including Albert Herter's Portrait of Bessie (1892) and Henry Ossawa Tanner's portrait of his own mother. 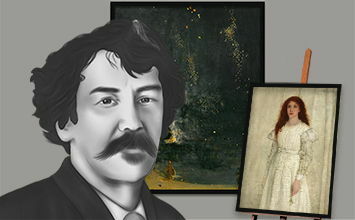 Whistler's painting has since developed a considerable presence in pop culture, having been referenced in numerous movies, cartoons, and advertisements. Artwork description & Analysis: The fifth in Whistler's Nocturnes series that included countless etching, pastels, and paintings created during the 1870s, Nocturne: Blue and Gold - Old Battersea Bridge offers a night view of London's Thames River. A pier of Battersea Bridge looms in the foreground of the painting with the tower of Chelsea Old Church and the newly built Albert Bridge visible in the distance. Beyond the bridge, fireworks appear as flecks of color in the sky. To create these paintings Whistler traveled by boat along the river in the early evening, sketching as he went. He relied on his memory and those rough sketches to create these thinly painted, atmospheric scenes of quiet tranquility. The artist's admiration for the Japanese aesthetic is apparent in the compositional similarities the painting shares with Under the Mannen Bridge at Fukagawa (c. 1830-34) by Katsushika Hokusai, one of Whistler's favorite Ukiyo-e painters. This work is considered the "most Japanese" of Whistler's nocturnes because of its simplified, silhouetted forms that created a two-dimensional flattening of the composition. Old Battersea Bridge was produced in Whistler's libel suit against John Ruskin as evidence of the artist's successful rendering of an artful impression or memory of a fleeting moment. As such, Whistler argued, the subject itself becomes inconsequential and the relationship between color and form paramount. Given the title "nocturne" after wealthy shipping magnate and patron Frederick Leyland described it as such, Old Battersea Bridge features variations of blues tinged with gold. Whistler's penchant for blurring forms and emphasizing subtle tonal differences, makes his nocturnes some of the earliest experiments in abstraction. They intrigued his Impressionist friends concerned with exploring the relationship between different colors and influenced modern French composer Claude Debussy who, in 1899, created an orchestral composition titled Three Nocturnes. Artwork description & Analysis: The last of Whistler's nocturnes and one of only six depicting London's Cremorne Gardens, Nocturne in Black and Gold: The Falling Rocket (1875) presents an explosion of fireworks in the night sky. Rather than offering a concrete image, the artist conveys the effects of fireworks over the river. In so doing, he successfully captures a sense of excitement and celebration. Painted loosely with sweeping brushstrokes of dark blues and greens interrupted by small bursts of bright color, the composition exemplifies the Aesthetic principle "art for art's sake" by conveying what Whistler described as a "dreamy, pensive mood," rather than a clear narrative. Although it is now considered one of the most important examples of Whistler's abstraction, The Falling Rocket was not well received when first exhibited. Some viewers questioned the merit of the seemingly convoluted subject matter; while others disliked what they considered to be his reckless and careless painting technique. When John Ruskin produced a negative review of this painting in 1877, Whistler sued the art critic for libel, submitting this canvas, along with other of his nocturne paintings, as evidence. Ruskin's condemnation of the artist's work as representative of "the modern school" was in fact accurate. Whistler's method of flicking paint at the canvas to create the fireworks in The Falling Rocket was appropriated by later modern artists, most notably Jackson Pollock. Artwork description & Analysis: Although best known for his paintings, Whistler received a request from his patron Frederick Leyland to consult on architect Thomas Jeckyll's interior design for the dining room in Leyland's London home. The room was specifically designed to showcase Leyland's impressive collection of Chinese porcelain and an early commission by Whistler, The Princess from the Land of Porcelain (1863-64), which held a place of honor over the mantle. Whistler's modifications were more extensive than anticipated by Leyland and the room came to be known as: Harmony in Blue and Gold: The Peacock Room. Whistler chose to make his Japanese-inspired painting the theme for the room, adorning moldings and wainscoting with a decorative pattern and reworking the leather wall hangings with a bit of yellow paint to enhance the colors in his painting. These slight alterations were approved by Leyland, but once the shipping magnate left for Liverpool, Whistler made many more, including painting the 16th-century Cordoba leather wall coverings Prussian blue and applying metallic gold leaf to shelving. These later enhancements were made without Leyland's approval and provoked a disagreement between artist and patron over adequate compensation for the project. Whistler expressed his frustration with Leyland by creating a wall mural depicting two fighting peacocks, believed to represent the artist and patron. Whistler never saw the room again and his relationship with Leyland never recovered. The elaborately decorated interior speaks to Whistler's deep understanding of the Japanese aesthetic, while also establishing the artist as a forerunner of the Art Nouveau style that would develop only a few decades later. Celebrated as a quintessential example of the Anglo-Japanese aesthetic, The Peacock Room captivated later Abstract Expressionist painter, such as Robert Motherwell and David Smith, who sought to better understand the Eastern concept of "humanity's oneness with universal nature." Through the fighting peacock mural titled Art and Money, Whistler's creation also becomes significant as a visual testament to the artist's vehement passion for defending his work and creative process, often to the detriment of his relationship with patrons and critics. Oil, paint and gold leaf on canvas, leather, and wood - Freer Gallery of Art, Smithsonian Institution, Washington, D.C. Artwork description & Analysis: Measuring less than a foot in height and width, Little Venice (1880) is one of more than fifty etchings Whistler created depicting the city during his fourteen month stay in Italy, in 1879. He had already established his reputation as a master painter when these etchings were exhibited in London. They were well received and demonstrated his proficiency in multiple artistic media. Here, Whistler depicts the natural elements of water and air dominating the comparably diminutive urban expanse. The etching echoes his modernist approach to painting with regards to his use of loose, expressive lines to capture the ethereal beauty, rather than a topographical rendering, of the city. Little Venice, which appeared as part of a series of etchings collectively titled "First Venice Set" in the Fine Art Society's exhibition in London in 1880, helped Whistler rebuild his reputation following the Ruskin libel suit. The artist chose to avoid tourist attractions, preferring instead to capture the city's small canals and common quarters - the "Venice of the Venetians." In so doing, Whistler elevated the artistic value of these sights and helped establish a new iconography of the city. Whistler's experimentation with inks, tone, and paper, as well as his economic use of line and habit of wiping the etched plate to create an atmospheric effect are techniques that later modern artists, such as Mortimer Menpes and John Marin, adopted in their own work. First published on 22 Mar 2016. Updated and modified regularly.